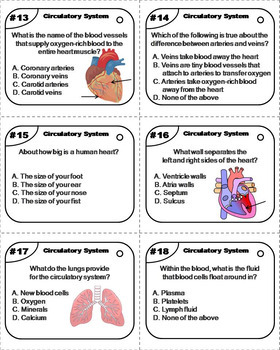 Anatomy Task Cards Bundle/ Human Body Systems Task Cards: Nervous, Skeletal etc. 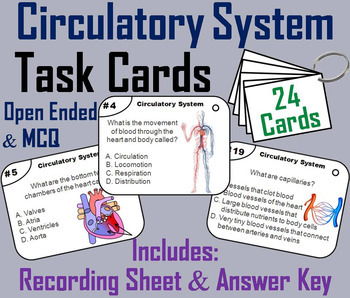 These task cards are a great way for students to improve their skills and knowledge of the heart and circulatory system. 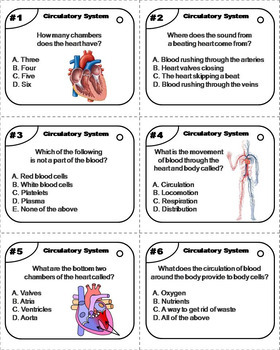 This product contains 24 cards with multiple choice questions about the heart and circulatory system. A recording sheet and an answer key are included. Blank cards are also included for questions to be added, if wanted. 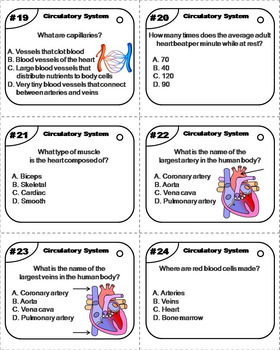 The same 24 cards are also available as open ended questions. Space Science: Get all 7 (25% OFF) in the Bundle! Earth Science: Get all 16 (35% OFF) in the Bundle! Life Science: Get all 17 (35% OFF) in the Bundle! Physical Science: Get all 21 (35% OFF) in the Bundle! Anatomy: Get all 11 (30% OFF) in the Bundle!